Some solar farms are just acres of giant solar panels. Some are modular mirrors that direct the Sun to one super concentrated point on a single solar cell. I would love to make a stadium-sized solar collector, but I lack the resources. 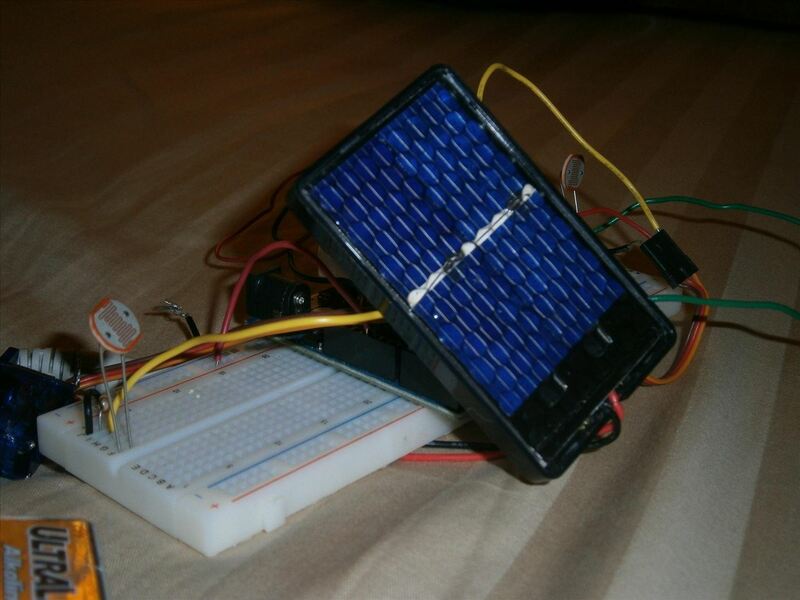 Instead, I made a simple solar tracker using an Arduino and servo. I plan to mount this on a robot Mars Rover style, but it works just as well for stationary projects. Connect up the circuit as shown in the diagram below. We are using two LDRs as sensors on analog pins 0 and 1. We are using the servo for output on pin 9. 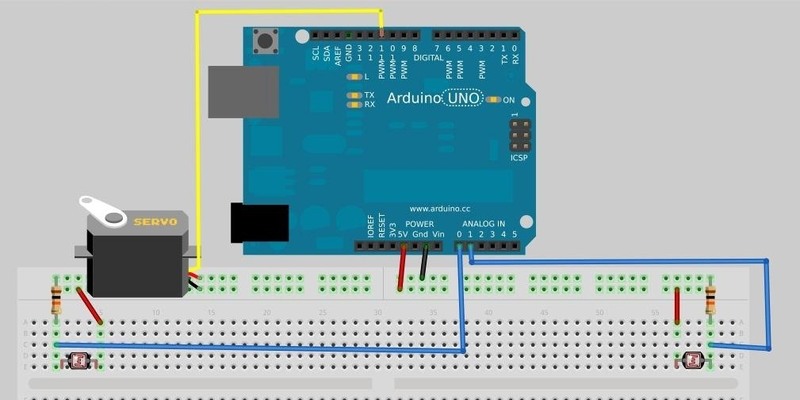 Don't forget to power your Arduino! Here is how mine ended up looking. There are tons of solar tracking Arduino programs out there and you should pick the one best suited to your project. I am only creating a one-axis tracker, but there are lots of online projects that explain the process for two-axis trackers. The code for this project was taken from this guide for a two-axis solar tracker, so that if you add another axis later on, the code should still work fine. Download the code here. 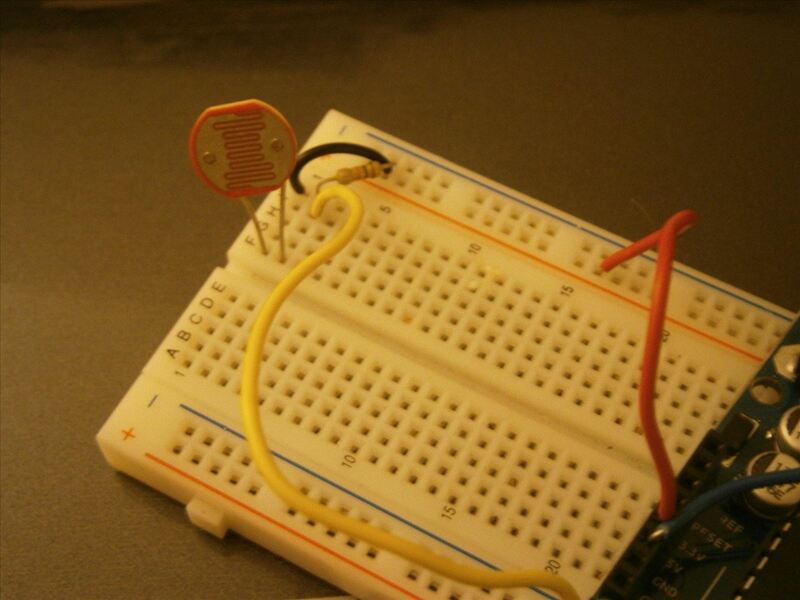 Upload the code to your Arduino and bring the breadboard outside or to a lamp. Time to see what your solar tracker is made of. 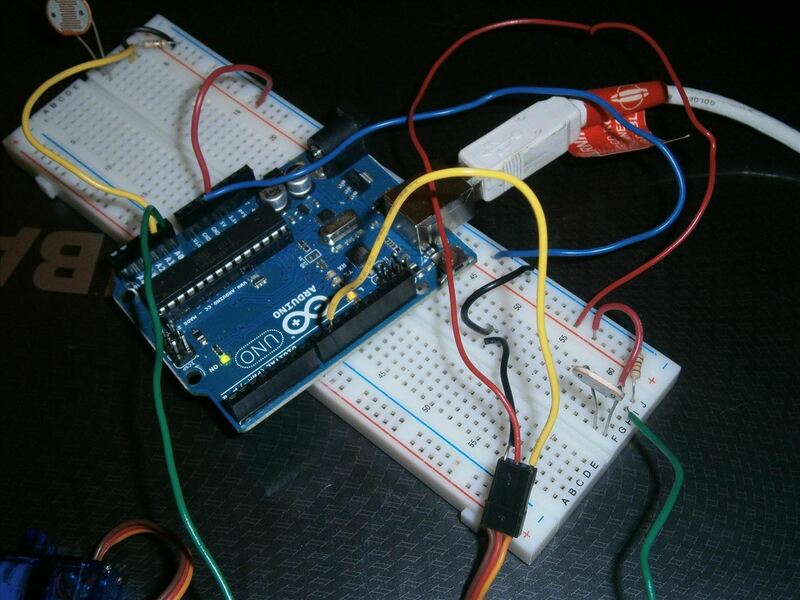 Power the Arduino and bring the whole system over to your lamp. When you move the lamp towards either side of the solar tracker, you should notice the servo pointing towards the direction of the sunlight. If you see your solar tracker working, it's time to mount up a solar panel. Strictly speaking, you could use a solar tracker for anything, from drying fruit to terrorizing ants, so don't feel obligated to buy a solar panel for this project. You can just hot glue the breadboard to the servo horn if you want a super simple mount. 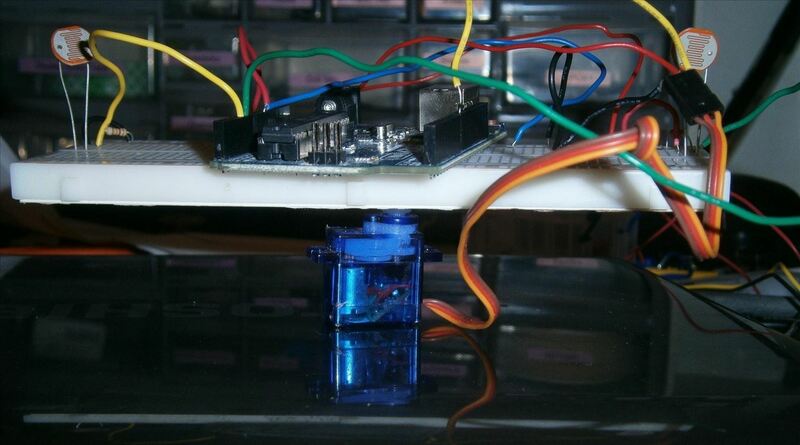 However you mount the servo, panel, and LDRs, make sure the panel is facing the same direction as the light sensors. Above, if I had pointed the light sensors horizontally and the panel vertically, there would be at all times a perfect maximized sunbeam just out of reach of the solar panel! Solar tracking usually only makes sense for small projects and special cases. The sun-concentrating mirror farms are much cheaper than both traditional solar and motorized solar tracker farms. On the small scale, I would love to create some animatronic flowers that follow the sun! What would you do with a solar tracker? Let us know in the comments below or in the forum. As always, feel free to message me personally with any questions. How To: DIY Solar-Powered, RC Lawn Mower: Cut Your Grass Without Ever Leaving the Couch!